Emvie is super modern and crisp, which I love because it only makes the view better. The master bedroom is huge too! Your guests will love the gazebo and upper level balcony, and the view isn’t too shabby either! Great for a family or couples! Emvie Villa overlooks Orient Bay, only a short drive to beaches and restaurants. 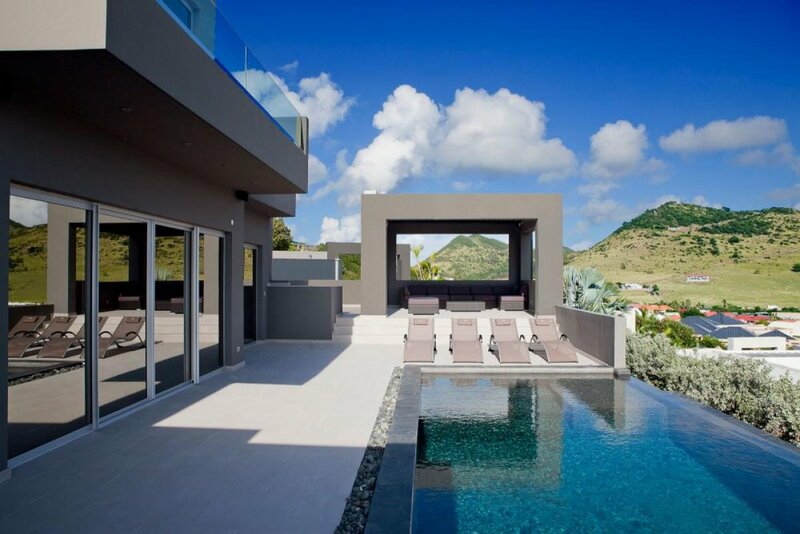 The villa has coastal views both day and night, and sleek architecture throughout. The villa entrance has Japanese-style gardens and koi fish. The infinity pool has LED lights for evening swims, and the gazebo provide ample space to relax and take in the view. Enjoy an al fresco lunch at the covered dining area, or sunbathe on one of the loungers. The open floor plan of the living area and kitchen seamlessly blends with the pool deck, so guests can interact and relax together from any point on the bottom level. The living area features a flat screen TV and connects to the bar area and modern kitchen. Each of the three bedrooms are air conditioned with interior access. Two of the bedrooms are located on the living area, each with a queen-size bed and an ensuite bath. The first bedroom has a glassed-in porch overlooking the infinity pool, and the second bedroom has a terrace with a naturally heated hot tub. The master suite is spacious, with a king-sized bed and ensuite bath. It takes up the entire second floor with its large terrace and Jacuzzi. The ground floor has an air conditioned, fully equipped gym with a treadmill, stationary bike, weight bench, and free weights. Emvie Villa has secure parking through an electronic gate. Orient Beach is just a few minutes away, and dining is a 10-15 minute drive from the villa. First, the good points: this villa spared no expense in providing top of the line modern amenities. I loved the Siemans stovetop! The place was spacious and private, something that really matters to us. The view was wonderful. We spent a lot of time in the shaded pergola, a real plus. Now, the bad points. The pool, although it was spectacularly clean, was deep everywhere and would be good only for lap swimmers. There seemed to be a major emphasis on sleekness to the detriment of comfort and practicality. For instance, the sink and dishwasher were not in the kitchen proper, but in a cramped little room. The living room furniture was uncomfortable as were the chaise lounges which only had one position. Still and all we grew used to the place and came to love it. We used the hot tub almost daily. The showers were wonderful, with good water pressure. One of the bedrooms had two private decks—one with a soaking tub. The master was huge. Warning especially to older renters: the stairs to the master (about 15) are scary with no railing and only every other one lit. The master bed is rather low. And the tile outside the front door is very slippery when wet. The location of the villa was perfect as far as our needs went. We were able to get to Orient Beach in five minutes and to Grand Case in less than ten. It was nice being up on a hill—that helped with the view and the pleasant breeze. All in all, a good stay. Andrew was terrific—kept us informed throughout the planning process and made everything easy. I would definitely use WhereToStay again.